On monday I was at home having tea with my dear friend Svanhvít (who, by the way, today moved to Sweden for two years. I will really, really miss her a lot!) when the bell rang: It was from the post office! Judi, dear Judi, sent me a message on Ravelry on day telling me that something had come to her possession that she thought I might enjoy so she wanted to send it to me along with other small things. No more information was given to me... besides a teaser while the mysterious things were flying to Iceland: "Lizbeth"that comes in very nice colors including variegated. Humm. Well, as I said before monday was the BIG DAY! I received a box at the door of my place. My first impression was: Wow! This box is huge! Judi kept on asking me not to have too high expectations about what she was sending me... how could have I possibly done that! Impossible! I was sure that what ever was inside the box I was going to love it! When I was opening the box Gummi and Svanhvít were there. It must have been so funny to take a picture of us then as the three of us were open-mouthed (¿boquiabiertos?) while I was taking all things out of the box. So many things! A wonderful book about lace. I didn't know this one. It is really cool because it gives an overview of different lace traditions around the world with examples. It also contains a lot of technical points. Love it! This little box just killed me! It is so cute!! And the contents... Uuh La la! Cotton threads! Different kinds, different colors, things that I would have never found here! Come on! Egyptian Cotton?! Highlighter take... brilliant! To follow the lace charts... simply wonderful! Stitch markers. These are the cutest stitch markers I have ever had! Love the colors and the fact that they are monkey knots! And please notice the case to keep them! Some more cotton and a beautiful ball of baby alpaca in different tones of green. This is one of the things that make me (us really) drool. This is a pair circular needles with a 11" (28cm) cable (something I had NEVER seen) that belonged to Judi's grandmother! I love the package and the fact that it still even has the price on it: 23 cents!! This is a JEWEL. I think that I will most probably frame it and hand it in a nice corner of my place. This is very, very, very special. A n article about bobbin lace and sweet winter card. What can I say? I think that the images tell it all. I think I just can say THANK YOU SO MUCH Judi for this beautiful surprise that you have given me! Thank you for being such a KIND and GENEROUS person! And thank you somuch for your wonderful comments on my posts here... I always enjoy them a lot and it is always a pleasure to reply them to you! 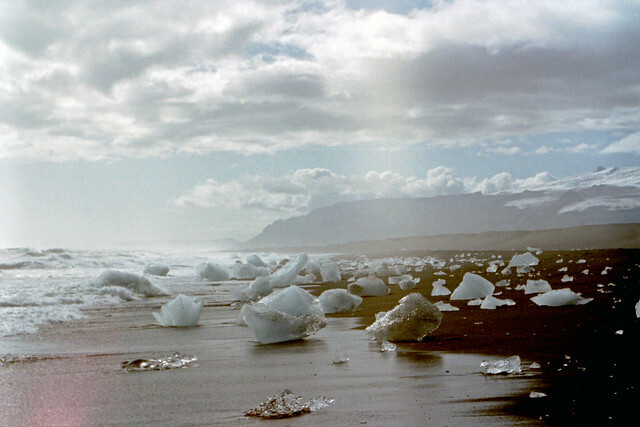 Jökulsárlón. 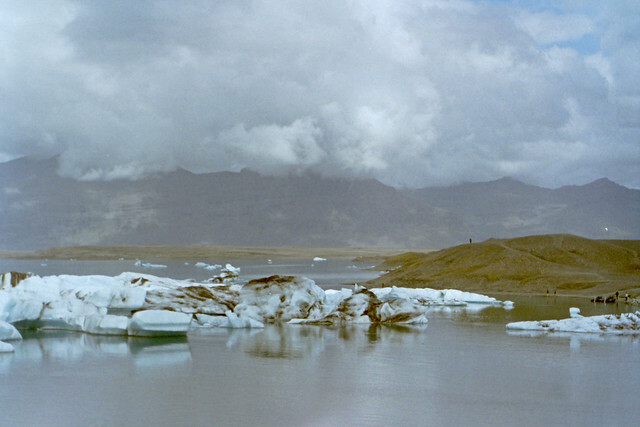 A glacier lagoon that is next to the biggest glacier in Iceland (Vatnajökull) from where all the icebergs come from. Breiðamerkursandur. 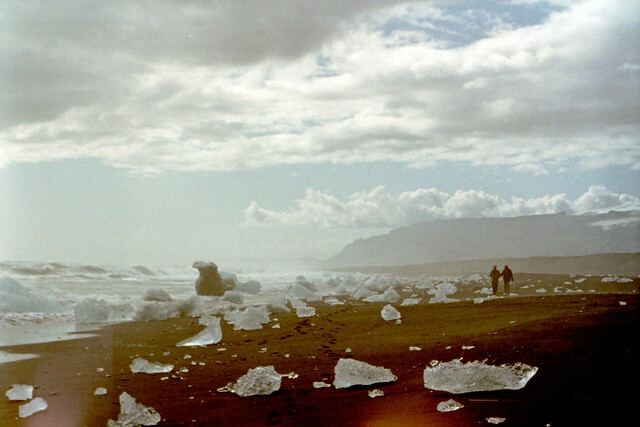 The lagoon runs to the sea and big pieces of ice end up stranded in a black sand beach. It is amazing to see the waves break on these ice pieces. Thank you for the birthday greetings and the wonderful photos. That last one is breathtaking! 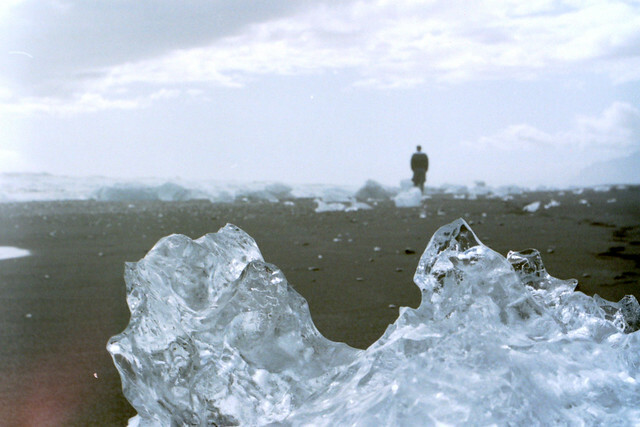 It must be a really neat experience to walk among large ice pieces on black sand and also hear/see waves breaking! In our minds it just doesn't seem to all go together - but yet it does. nice people, deserve great presents.. I am happy for you and thank you for sharing such nice pictures about your country..
bueno vamos a ver loq uela maravillosa Judi envio , me parece tan lindo todo y me doy cuenta que ella es una persona muy generosa, y muy linda, !!! lo que mas me gusto fueron las agujas de su abuelita, que linda ella en enviartlas, me parec un regalo sin precio !!! besitos enormes, cuidese mucho , y te mandaré el datito de las empana, mm que ricas !!! Þetta er alveg ótrúlegt. Dásamlegt hvað fólk getur verið gefandi og gott - eitthvað svo gott að vita af svona fólki í heiminum. Þetta eru ekkert smá flottir hlutir alltsaman. Ég er nýbúin að kaupa mér þessa bók á útsölu í N4 - hún er frábær... myndirnar eru einsog alltaf alveg stórkostlegar. Ein spurning: hvar lætur þú framkalla gamaldags filmur? Og mikið ofsalega hefur verið gaman hjá þér þegar þú opnaðir pakkann, jól í September! ;) Spennandi allt sem í honum var, og fallegt af konunni að senda þér svona gersemar! Wow, the photos are unbelievable! Iceland truly is a special place on Earth.